People in the US looking to buy an HTC One will soon (June 26) be faced with a tough decision – buy One with Sense 5 or a One Nexus Experience (and lose some functionality). But if you already bought one, the choice has been made. Or has it? HTC is reportedly "examining the best way to support early adopters of the One," so there could be an official AOSP ROM coming to the HTC One. 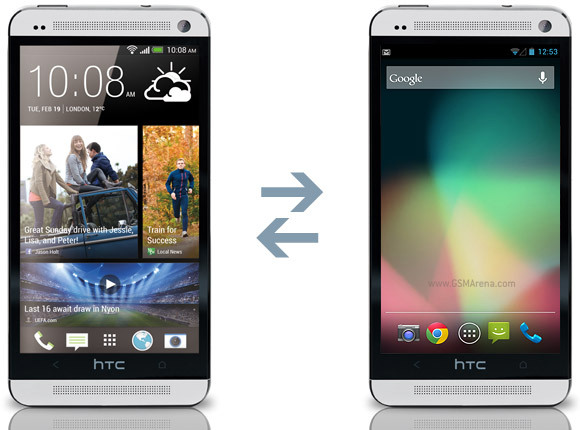 Whether HTC One Nexus Experience owners will be get a similar choice with a Sense 5 ROM remains to be seen. There's no reason not to – both versions of the phone are priced around $600. That's $550/$650 for an off-contract HTC One with Sense (depending on carrier) and $600 for the HTC One Nexus Experience from the Play Store. Of course, HTC has yet to officially say that it's working on such ROM, so there's a possibility we're getting our hopes up for nothing. We'll have to wait and see what the company decides in the end. Now, if HTC and Google (and Samsung too) will bring a pure Android flagship to the rest of the world it would be great (the One Nexus Experience is a US-exclusive right now). Wow, HTC learned the lesson. That's unexpected. It could be pretty good. Sense 5 is the only UI skin ever I'd consider using over stock google OS since like ICS, but having an updated stock rom could mean way quicker updates to newer OS versions-> which is only a good thing. Bring it on!